I’m not someone who knows a whole lot about history. 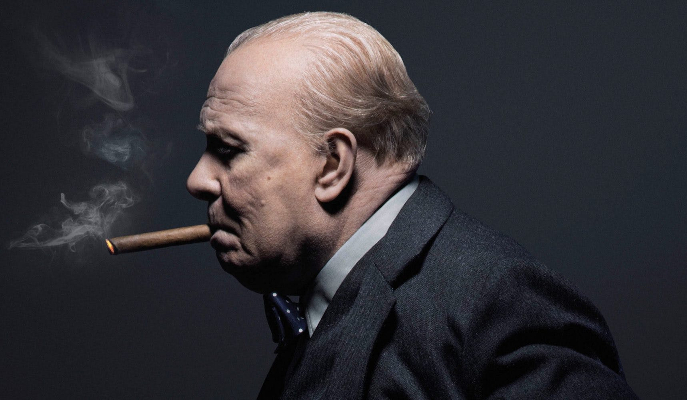 Before seeing Darkest Hour, I knew that Winston Churchill was the Prime Minister of England during World War II, but that’s about it. Fortunately, the way the plot of Darkest Hour is structured allows someone with as little knowledge as me to be able to follow along. As I was trying to understand the plot from the beginning, the things that stood out to me the most were the technical aspects of the movie. The cinematography is always interesting, appealing and new. From a twisting shot going down the middle of a spiral staircase, to a tracking shot of a random person walking the streets of London to show the peoples whose lives Churchill is responsible for even to an overhead shot of a group of people receiving a toast, director Joe Wright (Pride & Prejudice, Atonement) does an amazing job of keeping everything visually interesting. The lighting is also very unique in many of the scenes. A lot of the time, the lighting is coming in from whatever windows are in the room and you can see those rays of light coming in. This just gives everything a very real feeling. It doesn’t seem like it was filmed on a set, but rather that it was just filmed at the right time of day using natural lighting. Even in rooms where there are no windows and everything else is dark, the candles or lights on the wall give a gritty and real feel to the image. The last technical aspect that really stands out is the score. This kind of historical film is not one where I expected the score to stand out, but it really does. It is fitting for a movie that deals with the most powerful people in Britain. A royal feeling is portrayed through it. There are a variety of melodies with a hurried piano and stringed instruments that give the film a very tense feel. It is able to add intensity and sense of urgency to a movie that is about 90 percent dialogue. The score adds to these aspects without a doubt. What makes Darkest Hour truly special is Gary Oldman’s portrayal of Winston Churchill and the change that he goes through. And when I say change, I’m not talking about the hours of putting on his prosthetic face that he had to do every day. I mean the change in character that Churchill goes through. Churchill becomes Prime Minister towards the beginning of the film, which is almost a year after the beginning of World War II. His stance almost the whole way through is that Britain must attack Hitler instead of trying to negotiate with him, as some of his cabinet suggest, saying, “You cannot reason with a tiger when your head is in its mouth!” He is willing to sacrifice tens of thousands of British soldiers to achieve victories because he feels Hitler must be defeated at all costs. Most of these aforementioned lives are the 300,000 soldiers on the beaches of Dunkirk, France, which makes the events in this film the planning that was behind the events in Dunkirk, which was featured at Lost Films last semester. With this, there are strong themes of nonviolence that are similar to Messiah’s Anabaptist background. It’s not until the war and the people affected by it that it is made personal that Churchill finally realizes the weight that is on his shoulders. Some of the actions that he is taking put the fate of thousands of soldiers in his hands. And if he does the wrong thing or his decision backfires, it will be something he will have to live with forever. But throughout the film, Churchill’s biggest motivation is doing what he feels is in the public’s best interest. He even says that he has put the public ahead of his family throughout his time in government. Once he realizes what the public wants, he is able to find his strongest motivation to do what he perceives as the right thing to do. Darkest Hour is a film that is able to show a real and personal side to somewhat of a historical giant. It would have been easy to make this movie about the government as a whole and what Britain was going through. But it made Winston Churchill sympathetic and understandable. It shows who Britain needed in its darkest hour. You can see Darkest Hour at Parmer Cinema on Friday, April 13 at 6 and 9 p.m. and Saturday the 14th at 3, 6 and 9 p.m.